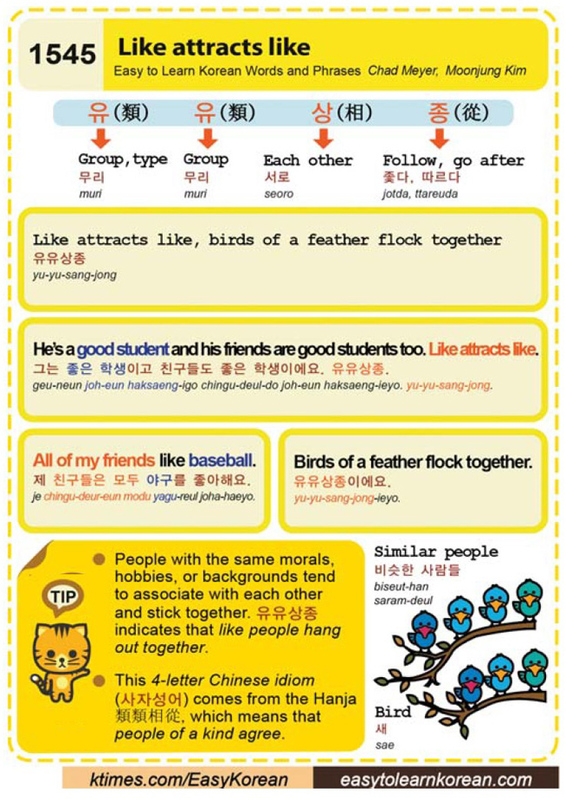 Easy to Learn Korean 1545 – Like attracts like. This entry was posted in Series and tagged All of my friends like baseball., bird, birds of a feather flock together, each other, follow, go after, group, He’s a good student and his friends are good students too. Like attracts like., hobbies, like attracts like, like people like to hang out together, or backgrounds tend to associate with each other and stick together, People with the same morals, similar people, type, yuyu-sang-jong, 從, 相, 類, 類類相從, 그는 좋은 학생이고 친구들도 좋은 학생이에요. 유유상종., 따르다, 무리, 비슷한 사람들, 사잣성어, 상, 새, 서로, 유, 유유상종, 유유상종이에요., 제 친구들은 모두 야구를 좋아해요., 종, 좇다 by easykorean. Bookmark the permalink.